Well, isn't this a surprise? Without any fanfare, Amazon has posted (and since pulled) a product page for a next-generation Kindle Paperwhite. The new e-reader centers on an upgraded display with higher contrast, improved lighting and more responsive touch input. There's also a faster processor, and the company promises both Goodreads integration and a variant of Kindle FreeTime that encourages young readers through an achievement system. If the listings are accurate, Amazon will sell WiFi and 3G versions of the new Kindle Paperwhite for $119 and $189 respectively. The WiFi model's page also mentioned a $139 ad-free version and a September 30th ship date. Check out a second image of the WiFi variant's listing after the break. 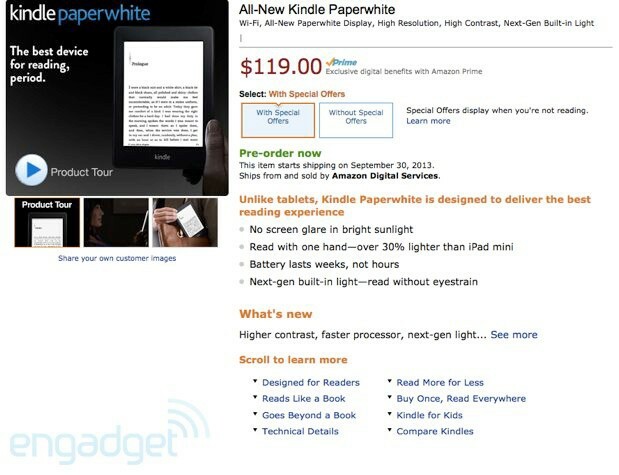 Update: That was quick -- the next-gen Kindle Paperwhite is now official.